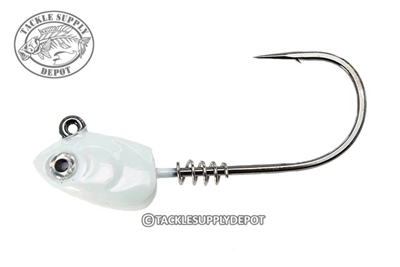 Until now, you simply couldn't find a premium, swim bait jig head with a premium Gamakatsu hook. The new Superline Swim Bait Head changes all that. The head profile is streamlined for a natural action. The lifelike eyes exhibit true fear to predators. Choose premium painted heads or unpainted for anglers that prefer a do-it-yourself custom look. A heavy wire, 60-degree angle Superline hook performs optimally with braided line and heavy monofilament. The Superline Swim Bait Head is also compatible with all internal and external swim bait rigging. Sizes: 4/0-1/8, 4/0-3/16, 4/0-1/4, 5/0-3/8, 5/0-1/2.